Broadcast Journalism students do not just learn about television news. An entire semester of their education is dedicated to learning about a different realm of broadcasting: radio. During their radio class, titled Journalism 304, students do large scale research and reporting projects throughout the semester. They research, produce, and write a 30-minute radio show that they have to cultivate an audience for, as well as in-studio guests. The portion of the class I am showing you is part of their weekly responsibilities. Each week, students have a lab where they produce, write, and report the morning news during three different shows on WRFL, station 88.1. Sounds like normal journalism student responsibilities, but there’s a catch. Lab starts at 6am, and there are three different shows: a 7am, an 8am, and an 8:40am newscast. The professor asks that they switch up the content of each show, and rewrite stories so they sound different and improve throughout the morning. This video takes you into the life of a JOU 304 student on a lab day. Welcome to the virtual reality tour of the Lexington, Kentucky Halloween Parade 2018! 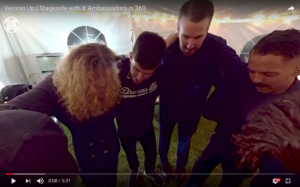 This VR experience will take you through all of the different aspects of the event. There is an art mart, where local artists can show and sell their work that a lot of them create specifically for that event. 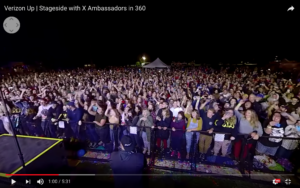 There is also a concert portion of the event that features local bands, musicians and other performance organizations like dance studios and theater groups. The parade is the big finale of the evening, with lots of spooky floats and treats to go around. There are so many different things to do, and so many different groups are involved in the parade that there is something for everyone to love. This event is fun for all ages and a great way to get ready for Halloween! 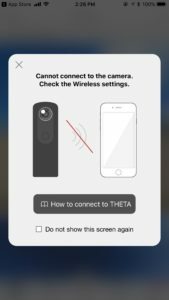 I’m going to review the Ricoh Theta iPhone app that I used to film a 360 video with the Theta S camera. This application is what I used to shoot my video, and the main way that I set up all of my shots for the project I was working on. It is sold by RICOH COMPANY, LTD. and is available in the iPhone App Store. For iOS devices, users only need to have this Theta app, no matter which Ricoh device they are using. However, Android users have to use different apps that correspond with the Ricoh device they are using. This means that if someone has a Theta S but also has a Theta V, they will have to have two different apps to control their devices. 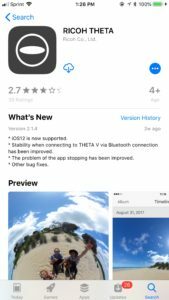 The Theta App is free in the iOS App Store. I think this app has the potential to be really great. However, I had a couple of issues with it while using it to film 360 video. There is no screen on the Theta S camera I was using, so the main way to set up your shots was by using the app, which was supposed to show you what the camera could see. However, when you are on the video setting in the app, you can’t see what the camera sees. Because of this, when I started filming I was blindly hoping that the camera was placed in the right position and capturing the shots I wanted it to. I didn’t realize until about halfway through my filming that if you switch to the photo option on the app, it shows you what the camera sees. I’m glad I figured this out, but it was frustrating for me because I kept having to switch back and forth between the photo and video screens, and sometimes I would accidentally take photos when all I needed todo was take videos. Another thing that made using this app a little difficult was the range of control it had on the camera. Using your smart phone as a remote controller for the camera is a very efficient way to shoot 360 videos and photos, however it is a slightly redundant feature of this app. I was shooting a video of a large empty theater from the center of the room, and I couldn’t use the remote feature the way I had intended to because it wouldn’t work unless I was very close to the camera. When you move too far from the camera, your screen changes to say that it can no longer connect to the camera. This requires you to move back towards the camera, and completely reconnect the camera to your phone. While this doesn’t seem like a big deal, it adds time to your filming process every time you move too far from the camera (which is not very difficult to do, as the range is very small). The main benefit of this app is how easy it was for me to figure out on my own. I didn’t have to look anything up or ask any questions about how to use the app for what I needed. Granted, I did have trouble finding the view of the camera when I first started using it, but once I got the hang of it I found that the app was fairly easy to use. For those using the app who find they are struggling, Ricoh has made a user guide available on their website. The guide seems a bit outdated, but it works offers answers to frequently asked questions users may have, as well as step-by-step guides on general use of the app. Individuals using this app are most likely those who are shooting very general, probably simple 360 video or photos. I used it to shoot a tour of a building on campus. This project was my first time shooting any kind of 360 media, and my first time using this app. This video is another way to get a more visual instruction about how to use the Theta app. It looks a little bit different because it is the Android version of the Theta S app, but it shows a couple of different features the app has. When I used it, the app was very slow, like it was overloaded with the footage I was trying to take. Here you can see that the app is smooth and shows very high quality images from this person’s Theta camera.